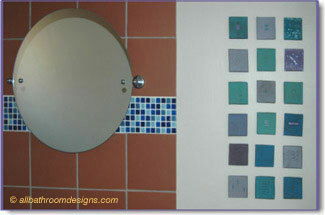 Or you may want to create your own tiles - unlike any other available on the market. The tile strip illustrated here was custom made according to the homeowners' design. A combination of materials was used in a mosaic pattern: slate, granite, pebbles and marble. Whilst there may be nothing unusual in the materials used to create the tile, no one else will have the same bathroom tile design. You could use so many exciting combinations in your choice of materials: bamboo, acrylic, glass beads, galvanized iron ... Especially when used on walls, as the materials won't have the same wear and tear as floor tiles. 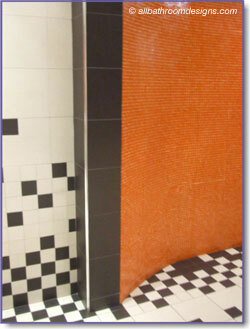 Large matt terracotta tiles are combined with glossy mosaic. The effect is accentuated by using contrasting colors - the warmth and earthy tones of the terracotta against the aquatic blues. The finishing touch is the handcrafted tile mural. It picks up beautifully on the different hues in the mosaic tiles. It's such a fun element and not difficult to make. Note: You could offset your handcrafted tiles from the wall for a three dimensional feel. You can get really creative with different shapes, textures and color in your bathroom designs. With the huge selection of tiles available, there are so many combinations that you can experiment with to come up with your own unique bathroom tile design ideas. Individuality need not cost a fortune. When planning your bathroom design, you can use standard tiles very effectively. By arranging simple black and white tiles in an imaginative way, it immediately becomes a design element, rather than just a functional floor covering. It may look random, but there is considered thought behind the arrangement of the tiles. If you don't have the budget available to replace tiles, why don't you consider painting them - or just some of them! You can break big tiles up into different shapes by simply masking and painting demarcated areas, creating a totally new look. If you are tired of floor-to-ceiling tiles, you can add a texture to the upper part to imitate plastered wall and you can create a tile border with stenciling. There are many products available on the market to transform tiles. Take a look at the areas in your bathroom that can do with a touch of tile magic and get creative with your bathroom tile ideas. Arrange ordinary tiles in unusual patterns - do the unexpected!